Well, it was HOT here today. It hit 82 degrees today, a record for this date. We did some yard work this morning and cleaned up all the leaves around and in the pond. Fish are loving the warm weather, but they follow me around the edge of the pond because they want me to feed them, but water temp has to be 50 and it's not there yet, so have to wait. A couple of more days of these temps and I can feed them. 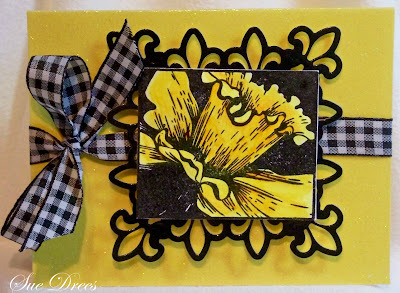 Today's card is a beautiful daffodil stamp from Technique Tuesday. I stamped with Versafine Onyx ink and embossed with clear embossing powder. Colored with Copics. Ribbon is from Pizzazz Aplenty. The die cut is by Spellbinders. The card stock for the base of the card is glitter yellow. This stamp also comes with sentiments, inside sentiment is Enjoy The Day. Gorgeous, love the design, wow! wow fabulous sue, gorgeous card. What a gorgeous daffy! Happy Spring!